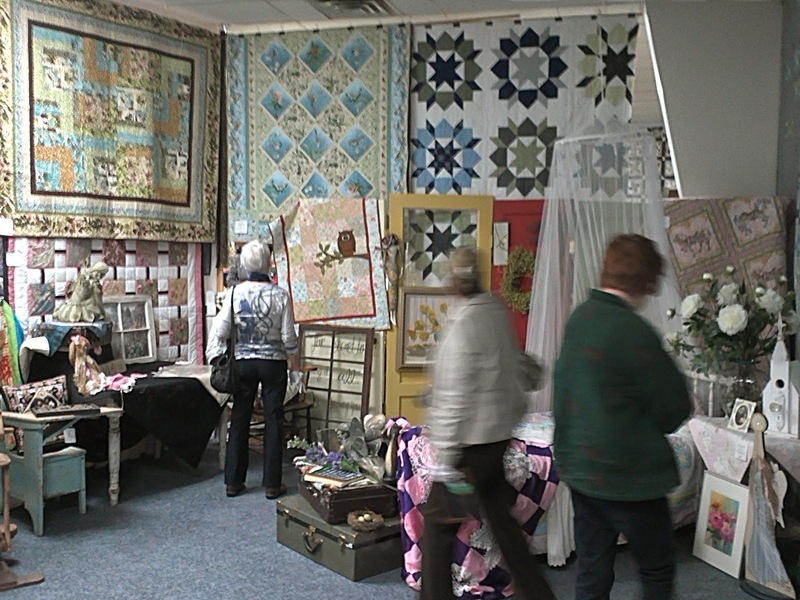 Many of you enjoyed my post on the Czar Quilt Show. 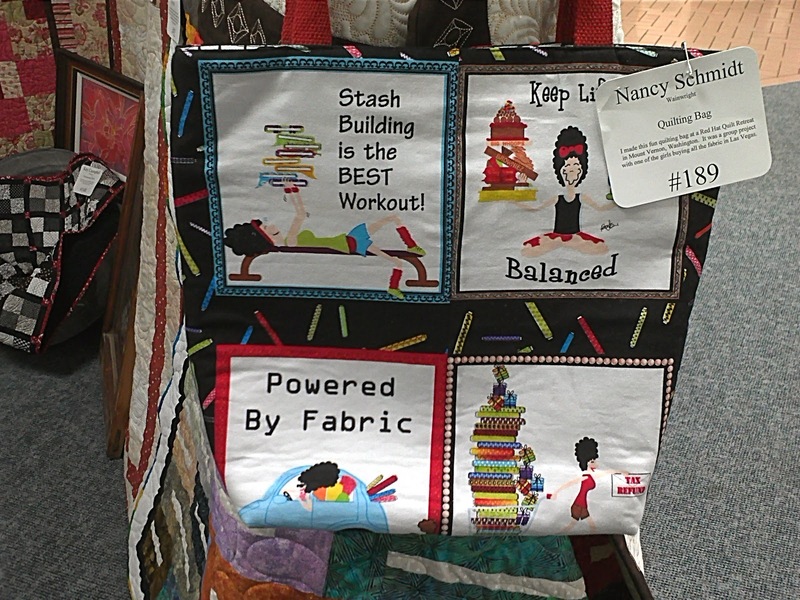 Here are some more photos of the show. This time they are taken by my husband Dave with his cell phone. I think it is interesting to see his perspective of the show and how it is quite different from mine. He has photos here of things I didn't even see or notice. He said he enjoyed the show and thought it was very well presented. 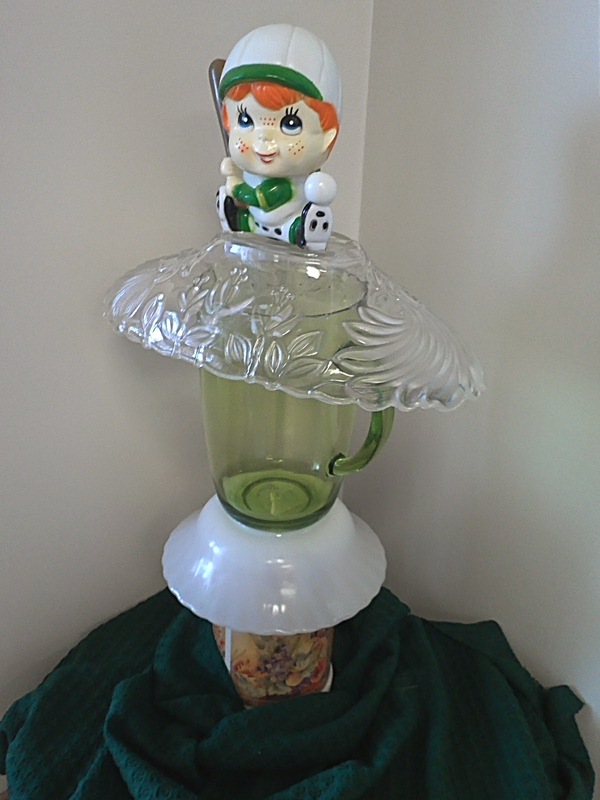 He liked all the antiques and the little displays and vignettes that were set up. He also said he liked the musicians and, of course, the food. 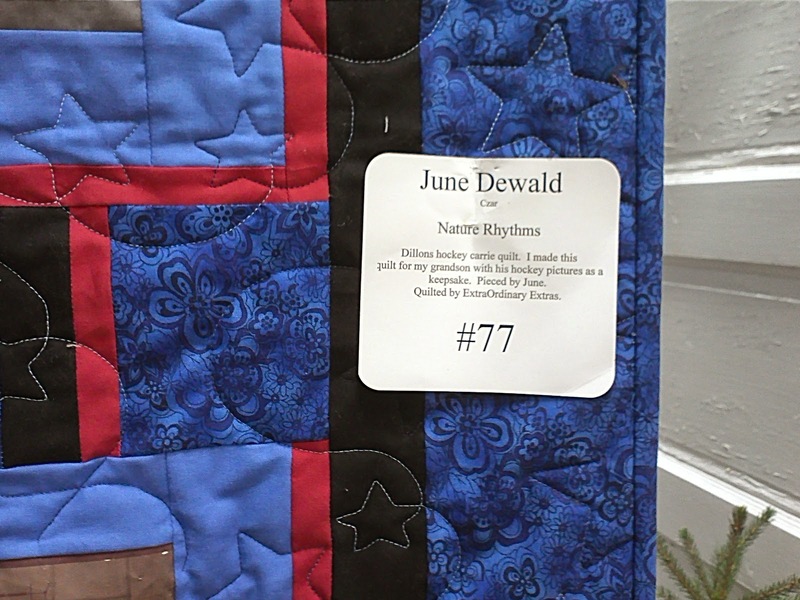 There was a scavenger hunt for the kids where they had to find different items that were actually in the quilts and my husband really liked that because it made the kids a part of everything. 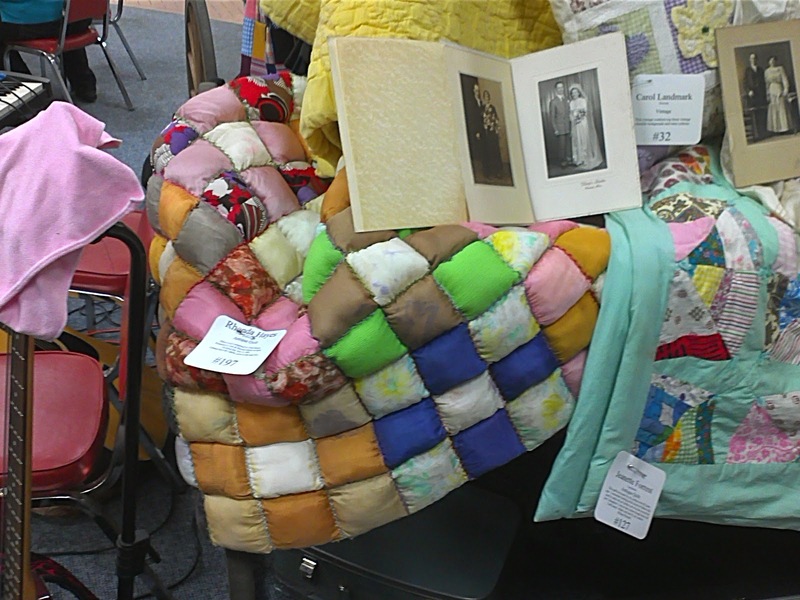 Let's face it... when I was gawking at quilts it was my husband looking after the three kids (mercifully the baby slept the whole time). 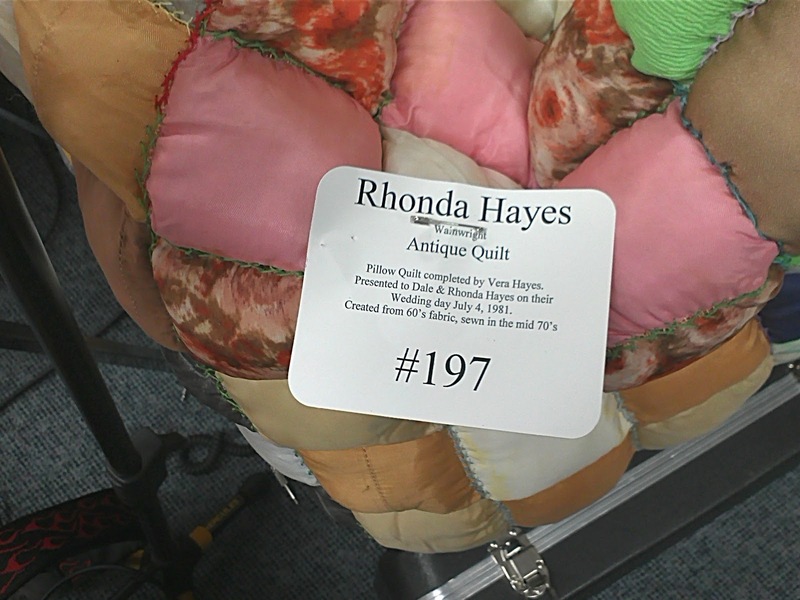 An example of a scavenger hunt clue is "tractor quilting". 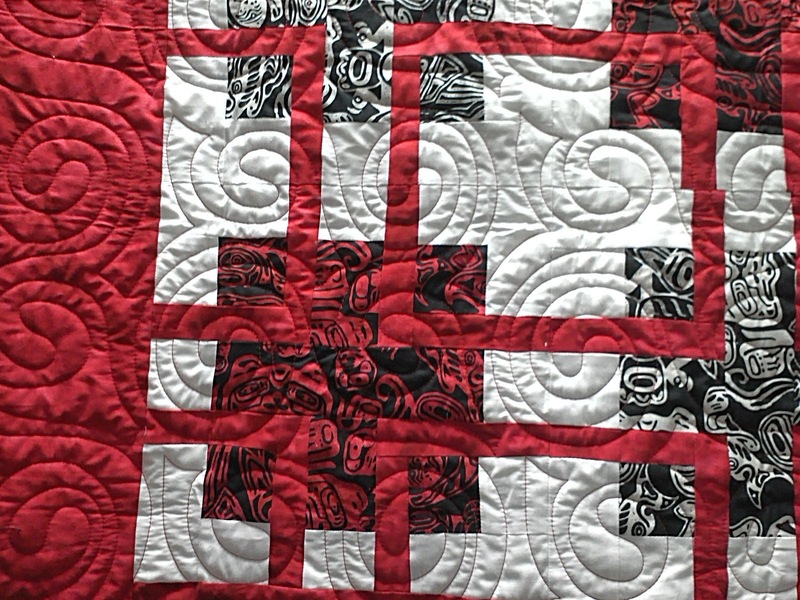 My son said, "Mom, what's tractor quilting?" I answered in the distracted way that Mom's do, "I don't know, I haven't heard of that technique." 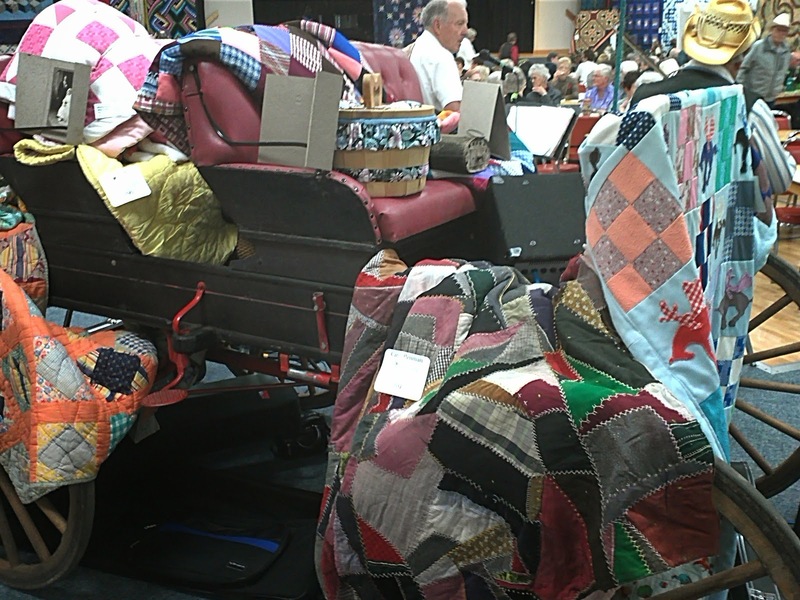 It turns out it was a quilt with tractors on it and there were tractors quilted into it with thread. Didn't I feel silly. 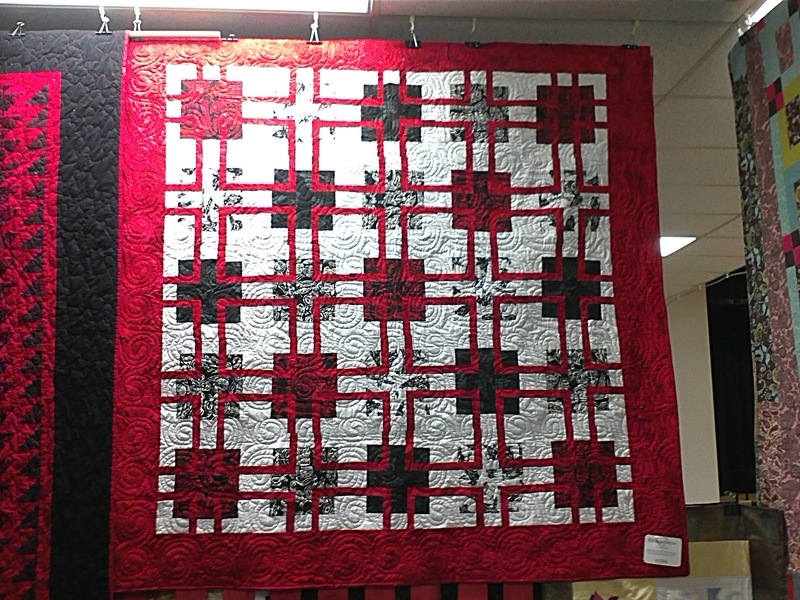 :) So, without further ado, here are my husband's photos from the Czar Quilt Show. 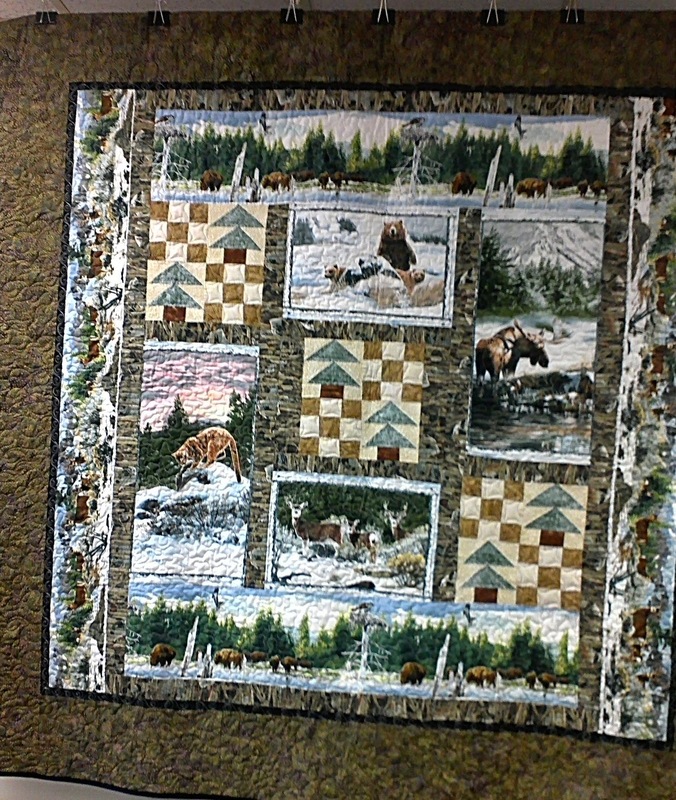 My husband really liked this quilt. So much so that he took four photos of it. I never would have thought he would be attracted to a quilt like this. 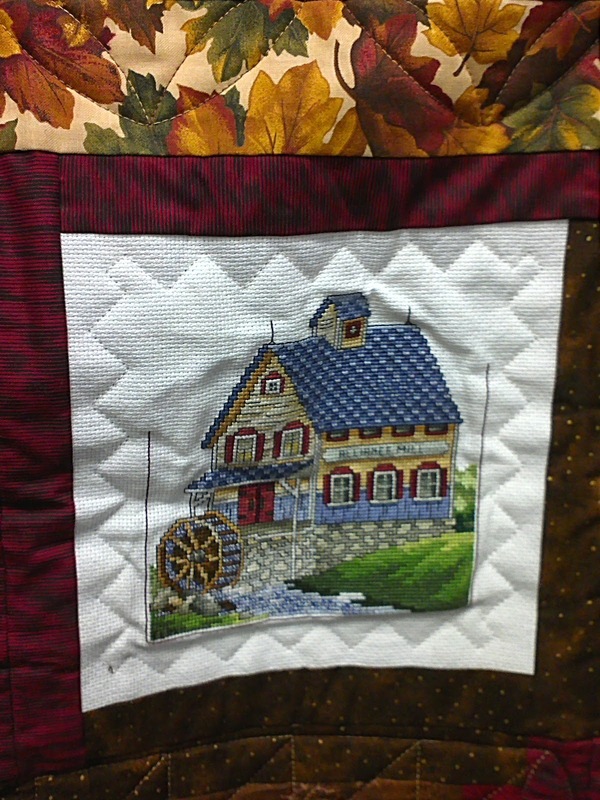 He said he liked all the cross stitched houses. Close-up of one of the houses. Naturally Dave liked this one. This is more of what I would have expected he would like. He was interested in all the antiques. He liked this wagon and that it was used to display quilts. 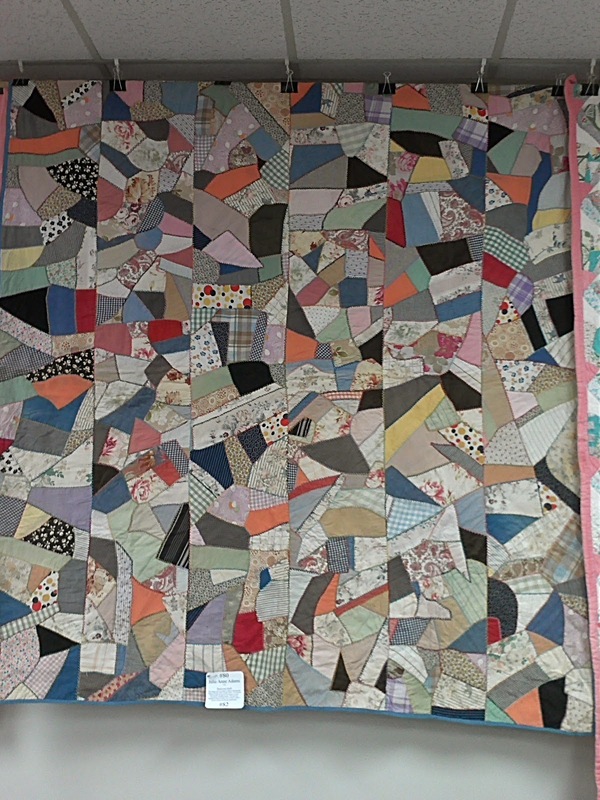 I did notice the hand quilting frame and meant to go back to it but never did. My husband found it interesting. 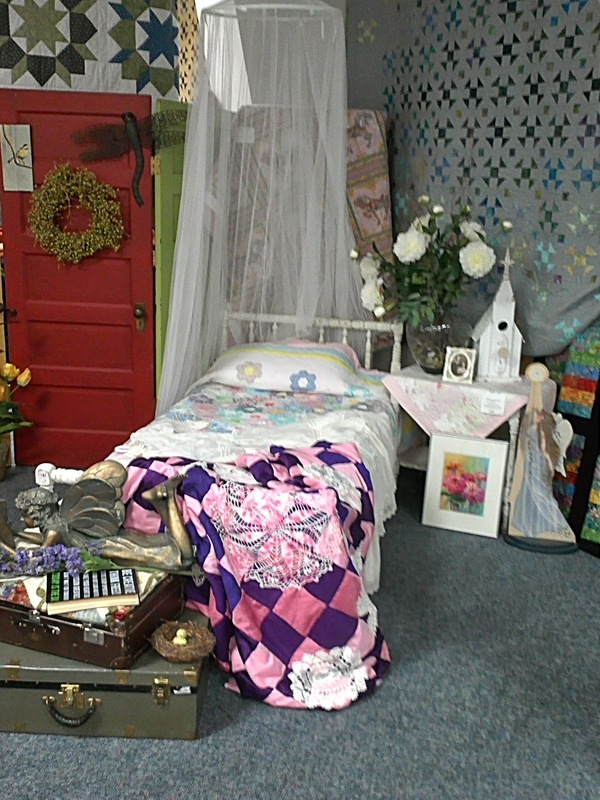 He thought to take a wider shot that shows you how the show was set up. 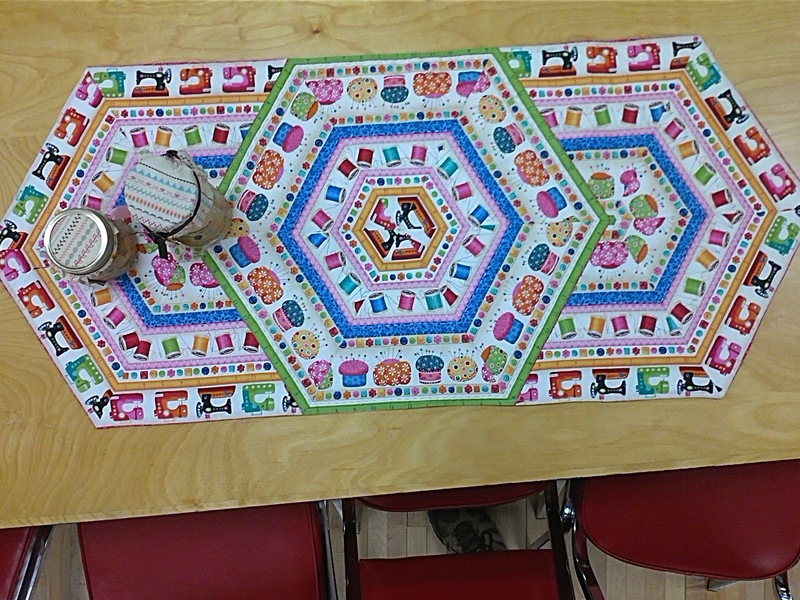 The tables in the middle were for eating lunch and snacks. 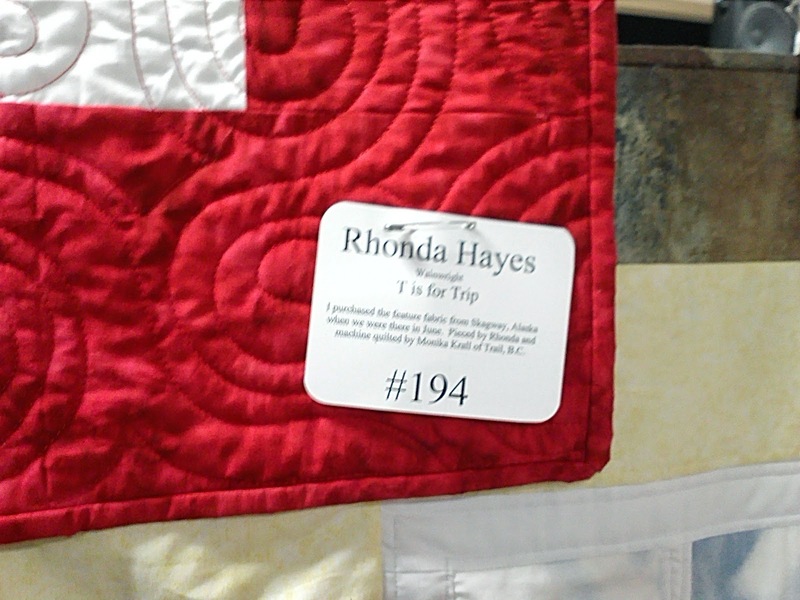 My husband also liked that there were more realistic displays of quilts like this one. 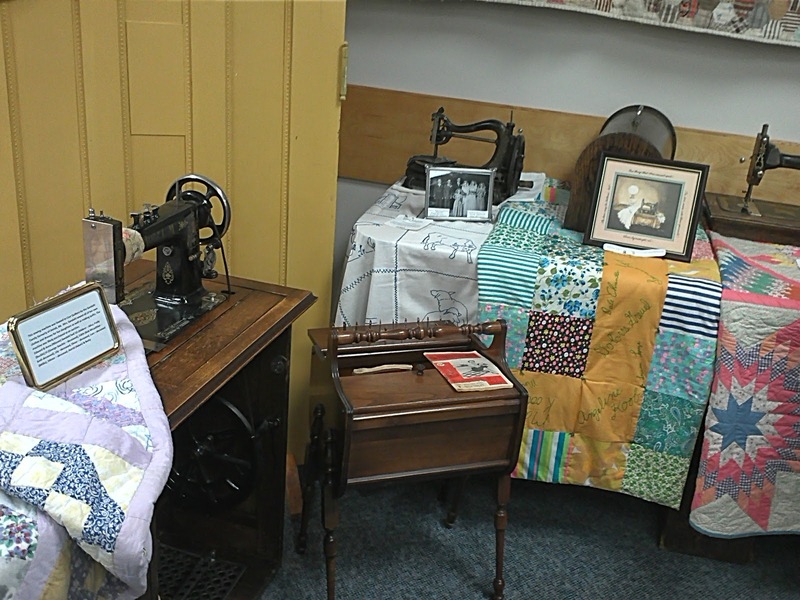 Another wider shot showing you how some of the quilts were displayed. He really liked this one and kept pointing it out to me. Ha ha! 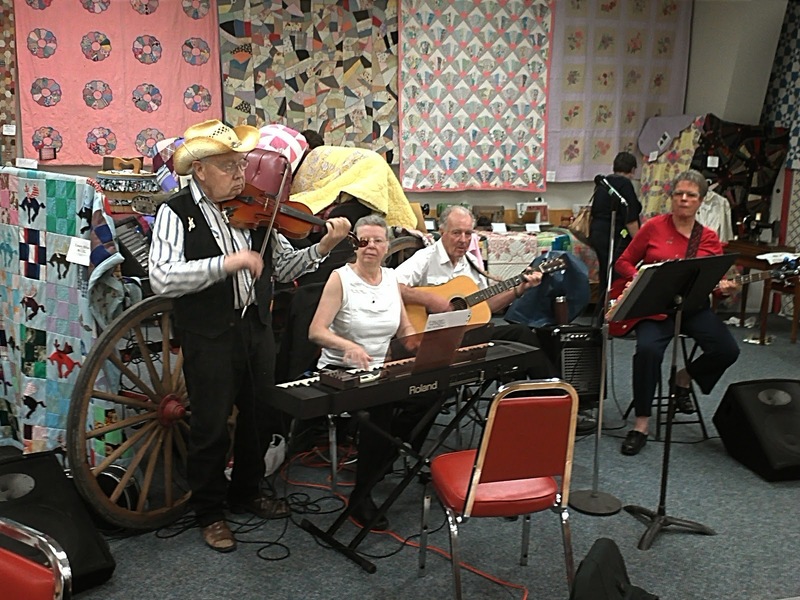 Here are the musicians set up by the wagon. They were a highlight for Dave. 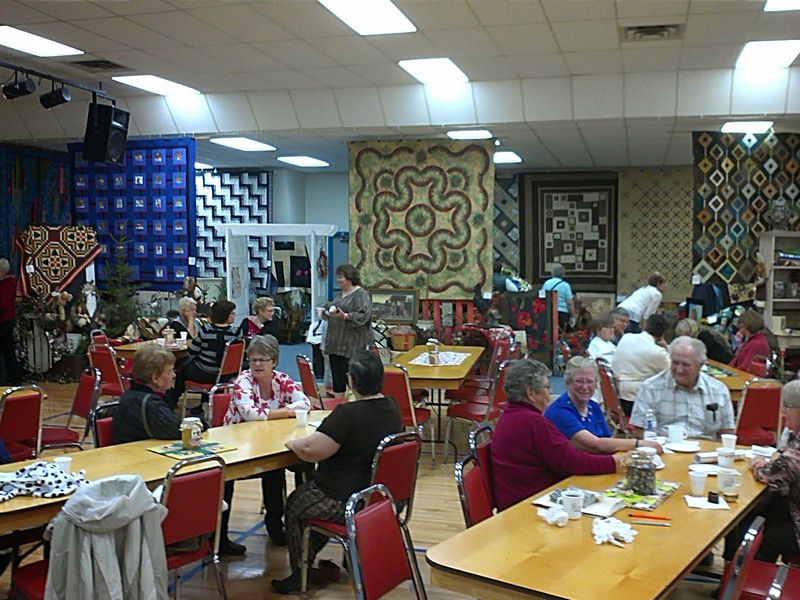 The tables in the centre of the hall all had nice quilted table runners on them. 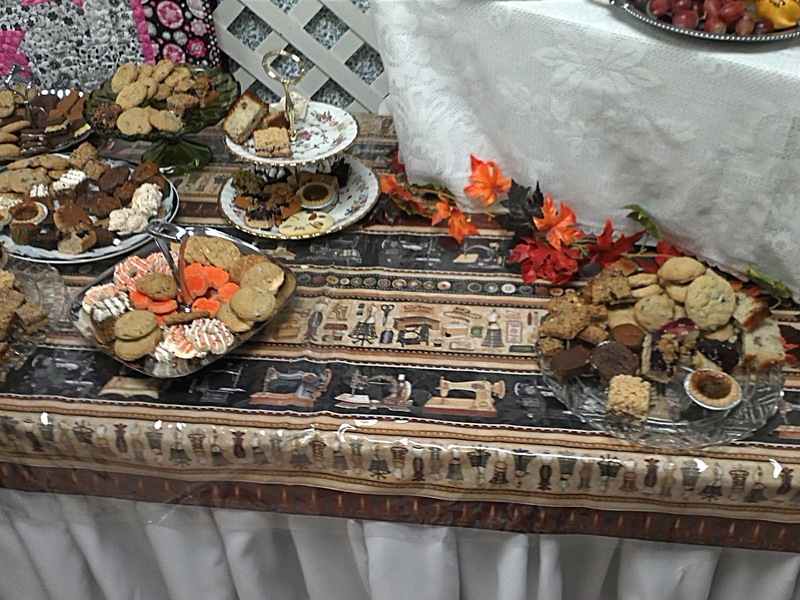 This display was set up right at the entrance. 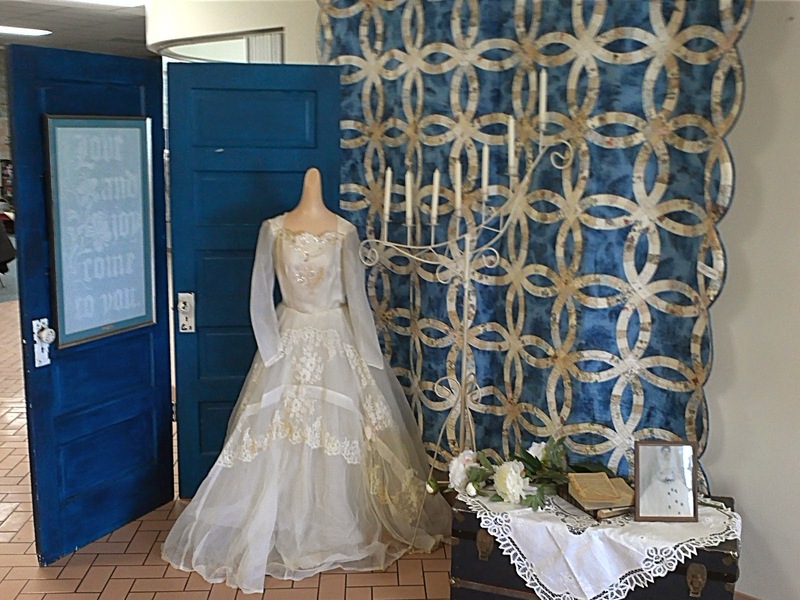 You can see the bride in the original wedding photo wearing the dress for the wedding this quilt was made for. 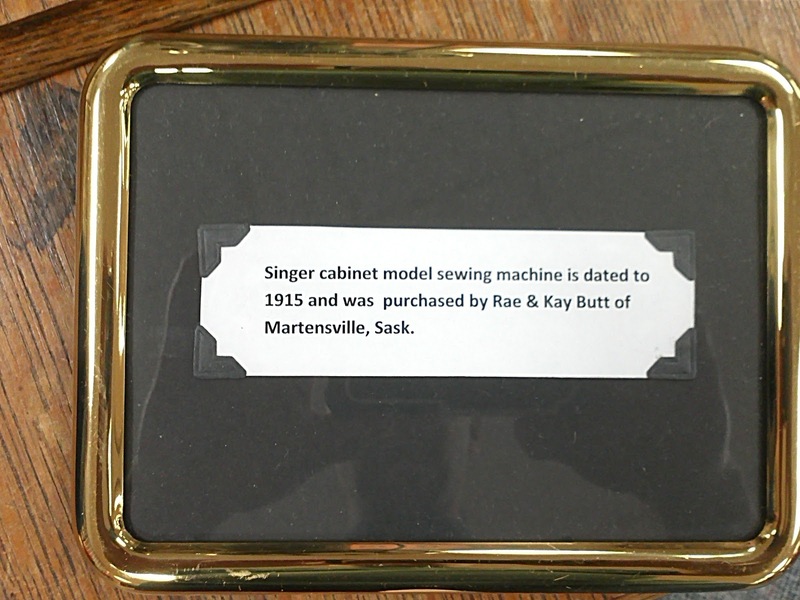 This card gives the age of the sewing machine in the photo below. 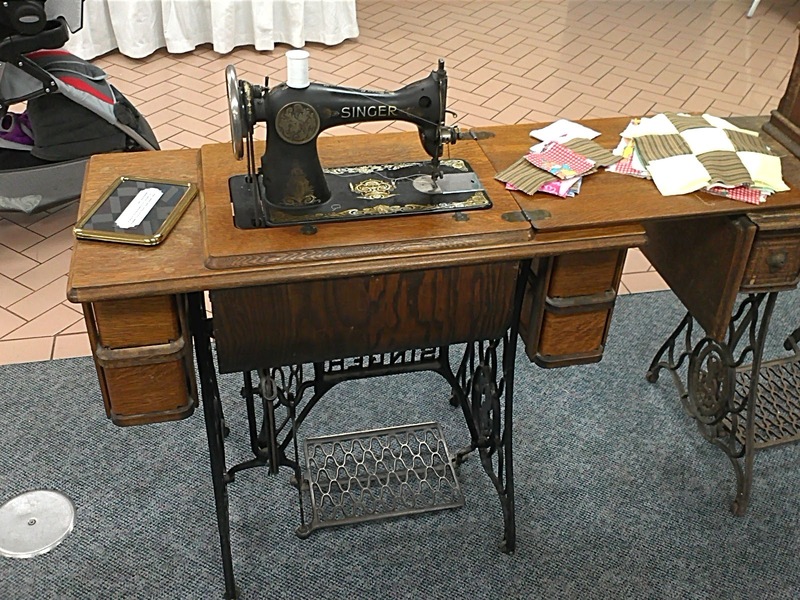 I had this machine in my photos too. We were both very interested in the antique machines. 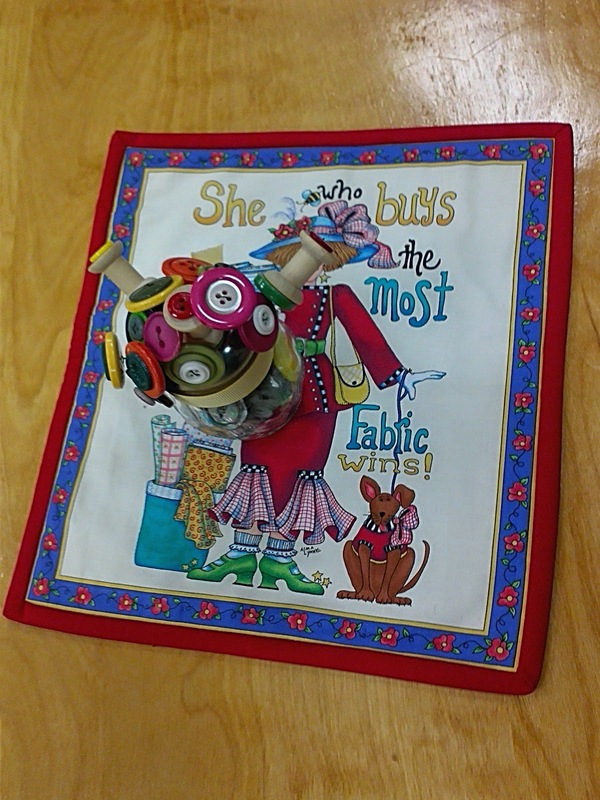 This card tells about the quilt below. 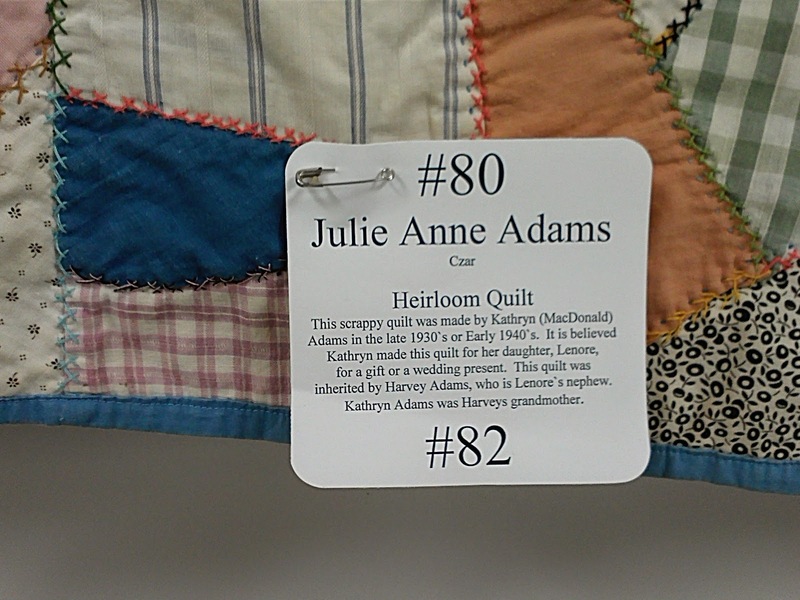 This card tells about the "Pillow Quilt" (sometimes called a puffer quilt) in the photo below. 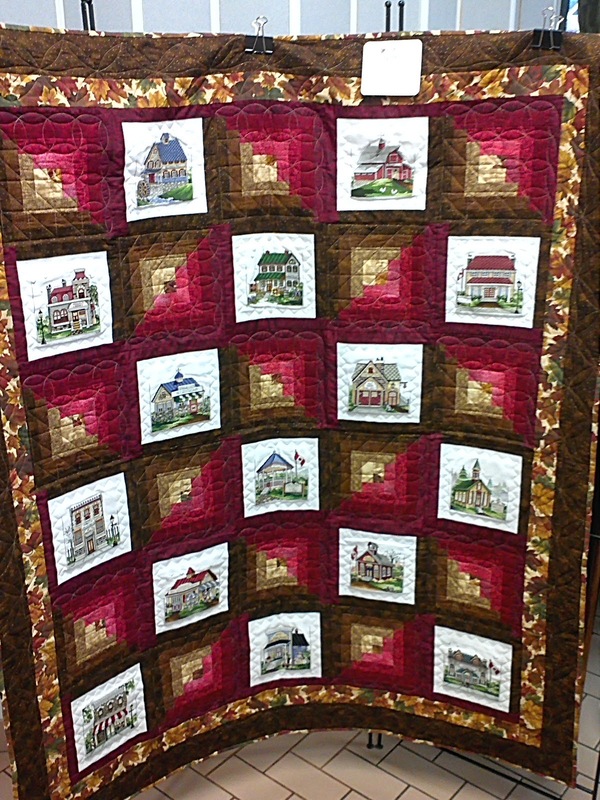 Dave really liked this quilt as well. Another wider shot. 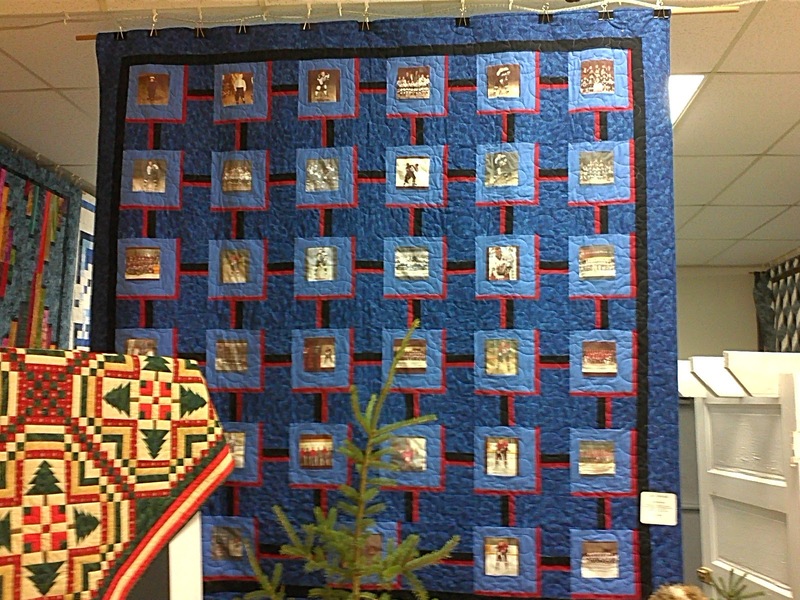 He also liked the blue quilt on the left and there are photos of that coming up. Do you think he's trying to tell me something? 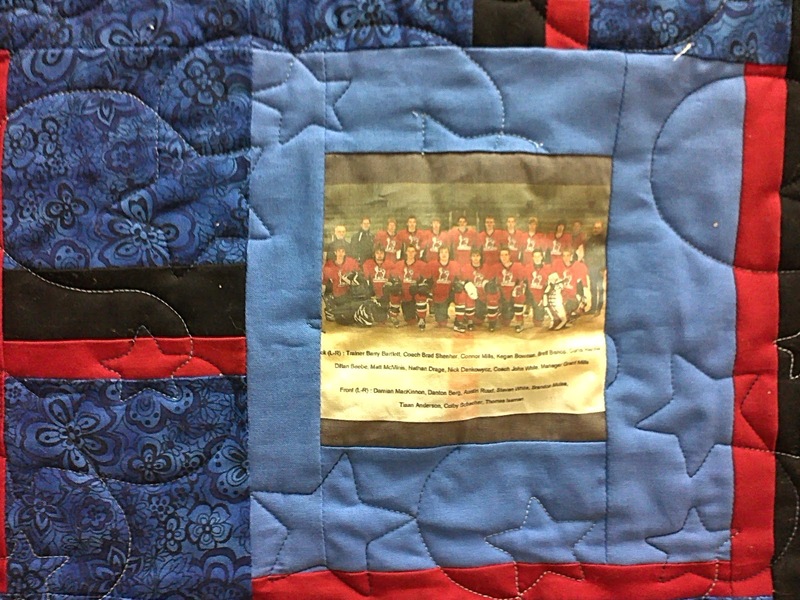 The photos inside the squares are hockey photos. 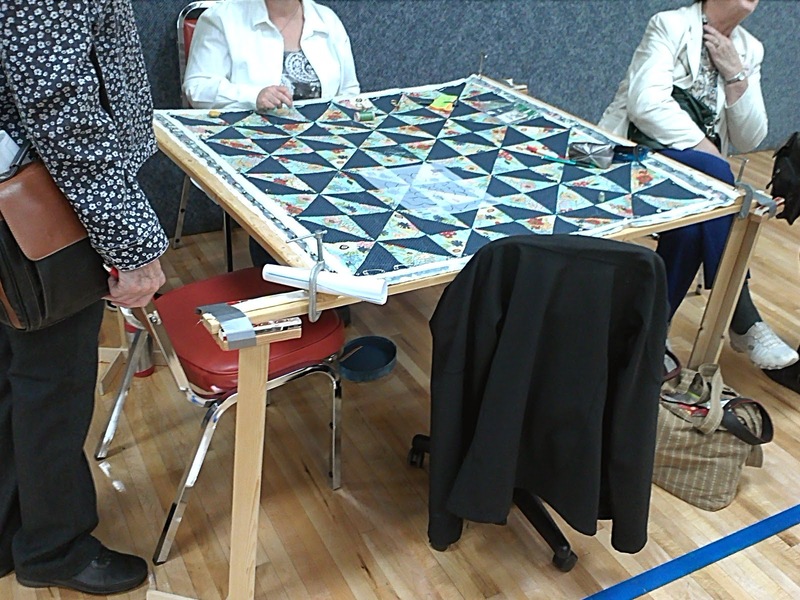 This is the quilter who pieced the hockey quilt. 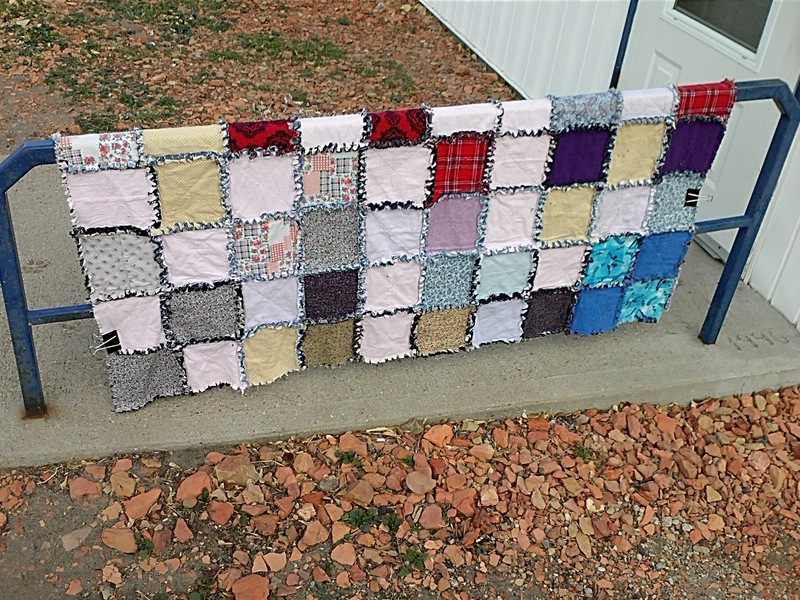 Close-up of one of the squares. What in the world? I never saw this. 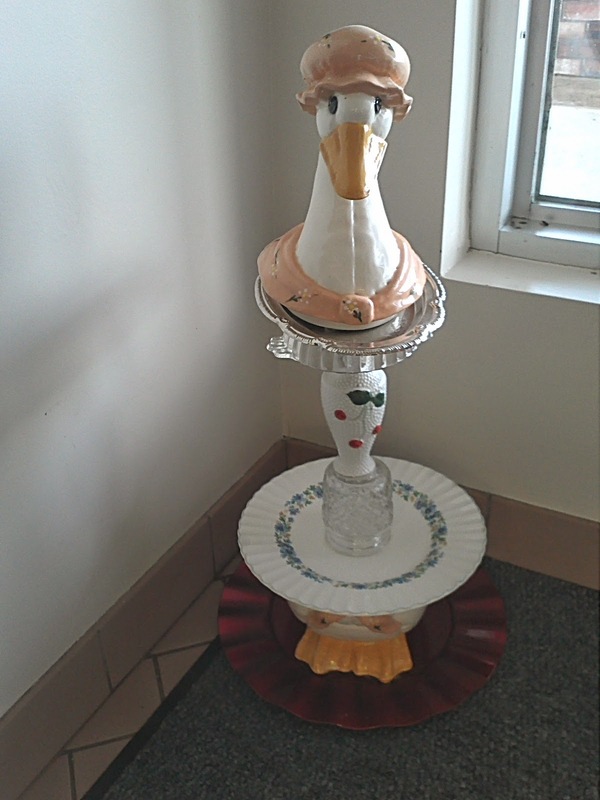 It's a little "sculpture". And another one. Again, I never saw this. The things men will notice eh? 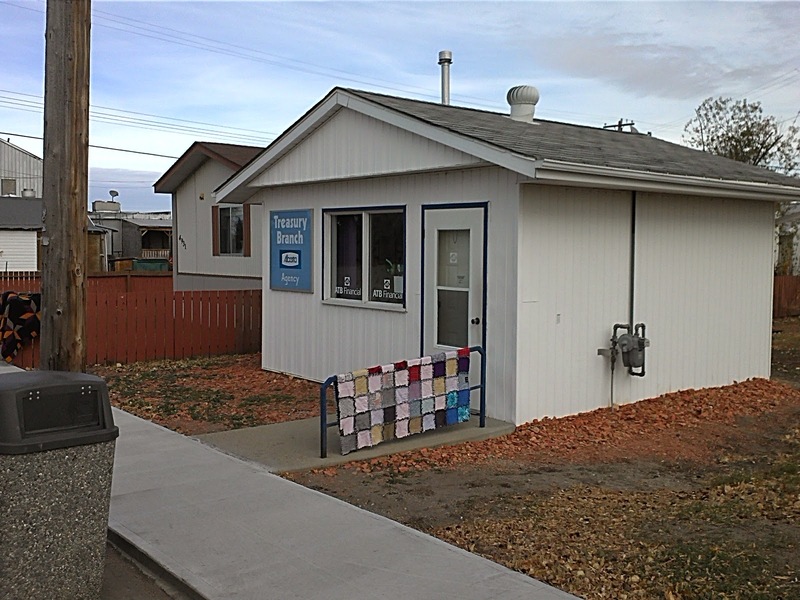 He was quite amused that this little building is the "Treasury Branch" and that it had a quilt on display. So there you have it. 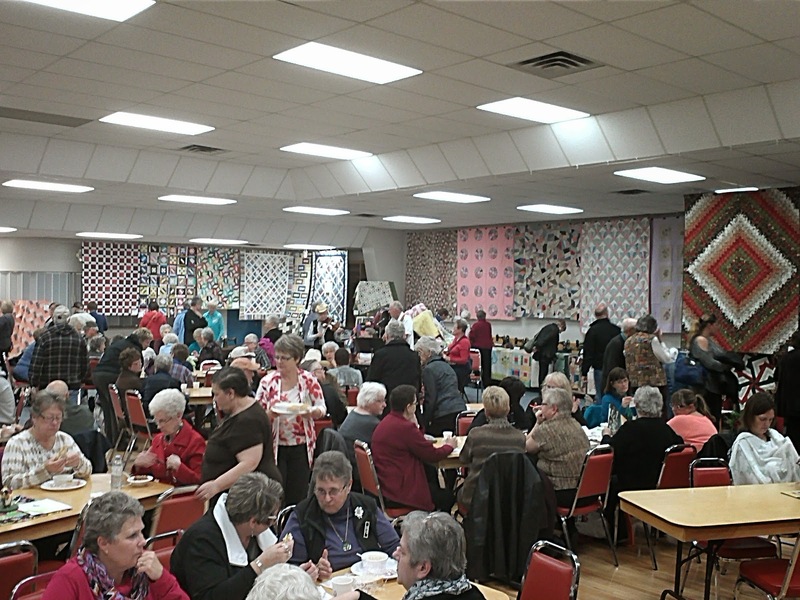 A (non quilting) man's perspective on the quilt show. He had 64 photos but I tried to weed it down. I guess he really liked it if he took that many photos!